As you may already know, I'm currently doing work experience at my local newspaper, the Solinger Tageblatt. I've worked there before, know the people and am on their freelancers list. The funny thing is: At uni I get told that my headline and intro writing really needs improving and my standfirsts are not the best either. But today I showed them all! 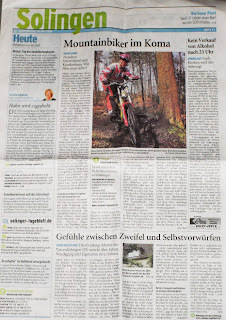 My article about mountainbiking made the FRONT PAGE of the local section! Read it here! The Solinger Tageblatt's proper front page contains national or global news. The first 8 pages are about politics and what's been happening in the world. But we write for the local section, which is produced completely separatly. We were short-staffed, and although I'm trusted with stories of all sorts (and I've only been there since Monday this time 'round) I never got a page lead! I had an anchor piece (the article on the bottom of the page, for all you non-journalists) on the front page before, but I was thrilled when the editor asked me whether I could write the cover story. Since I'm still lacking local contacts, everybody in the newsroom was helpful and provided numbers, proof read for me and check the housestyle. Over the weekend, there've been two serious mountainbike accidents in Solingen. One of the bikers is in a coma. The article is about whether it's dangerous to ride mountainbikes in Solingen, what equipment you need, where you are allowed to ride and how many accidents there have been and what the causes were. Although I knew yesterday, when we went to print, that I got the front, it was great opening the paper today. I'm just a bit dissappointed that I didn't get a byline. They only used my name abbreviation "coka". And because I had to reword the accident-reports one of my colleagues wrote to fit them into the story, we're both credited for it. But apparently the editor liked the piece. I'm back home now, and I does feel strange being back. I mean, everything looks the same! And my parents and sister are always around, which can be kinda annoying at times. I got back Wednesday night, and we went straight out for dinner - all 7 of us (grandparents included). Straight from the airport. No time to breath, sit down in my own flat and just BE HOME for a second. The followig day, we went out AGAIN! It's weird, really. I met a good friend of mine on Thursday at our local ice cream parlour. Today, I met one of my best friends who I haven't seen since before Christmas! Speaking German again is harder than you might think. Because I'm constantly thinking in two languages. Normally, I think in the language of the country I'm in. But switching back and forth between German and English all the time makes me forget some words in my native language. Just because I've used certain words so often in English, it just feels natural to say them in English - and I only noticed that I've switched languages when everyone else gives me that really puzzled look. I'll start working at my local paper again on Monday, and contribute to the Youth Page on Wednesdays as well. Here, at the daily newspaper, journalism is fun! Every day I go out, interview some more, some less interesting people, do vox pops, write my articles from 10 to 5 and cover some evening events. I learn a lot, make useful contacts and improve my writing. At uni, we only manage 6 magazines per academic year, and most are not fun to write for. Too many of us working on too few pages of a usually crap magazine nobody reads. And everytime I'm here I start to wonder, why I even bother to study it. You either have a talent for words or you don't. You might as well start work experience at a local paper, magazine, whatever takes your fancy, become a "Voluntär", or trainee reporter and -voilà, three years down the line you're a much better journalist with more experience under your belt than anyone who's still struggeling on the course at uni can claim to be. I learned more in 3 weeks work experience last year than in 4 semesters at uni put together! And I got published almost daily and got paid for it as well! Journalism is a hands-on job after all. If you don't practice your writing, you won't get any better. The latest newspaper screw-ups from "Hold the Front Page". They made me laugh. Enjoy! Sunday marked the housewarming party my friend Pad invited Simmy and me along to. And it turned out to be an “Only in England…” affair… at least for me. The house I live in, in Carlisle, is a normal, terraced house which looks just like any other house on my street, or in fact my entire neighbourhood. 5 rooms, plus kitchen, bath and a living room that’s a joke. Turns out, Pad only lives a couple of blocks from me, but it seemed like a whole other world. We turned the corner, and stood in front of this massive, stately home, complete with large garden and turret with skylight. Who knew Carlisle can be this nice?? He lives in the flat on the top floor (the one with the skylight) and even his bathroom is bigger than the room I have been living in for the past 20 months. And he only pays 30 pounds more than I do! Not fair! The original invitation to the party had contained a picture of the house, and I thought it was a joke. But standing in front of the real house, I began to get jealous. The garden was spacious, old stone steps leading down to the lower terraces. We had a BBQ and a big bucket contained various, ice-cold forms of alcohol. The sun was shining and it couldn’t have been much better. 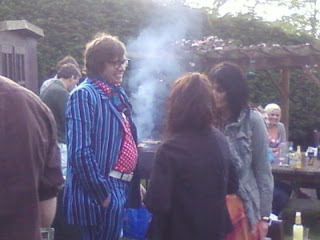 And then Austin Powers appeared. Most of us giggled at first, to which “Austin” just replied: “You’re laughing now – you’ll be screaming later”. Aww, bless British pop culture! He kept it up for the entire time we were there, which was close to six hours. 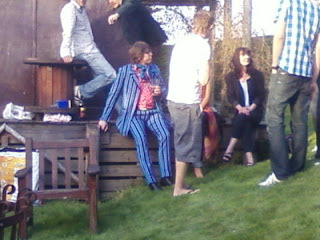 Honestly, he was Austin Powers, doing the moves, and he even had Mike Myers’ pattern of speech! As the evening progressed, he got a Cuban Cohiba cigar out and passed it round the bonfire, which we lit in the fire place in the back of the garden. I’m not a smoker, but I have to admit it was kinda cool to smoke a cigar with a super spy! Since I attended the party together with my boyfriend, it’s obvious we kept together quite a lot. 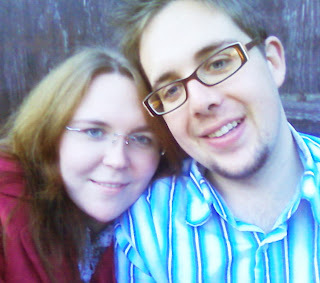 This prompted one of the party guests to come over to us and say “Can I just say: you’re such a cute couple! Honestly, it really warms my heart!” Awwww, how sweet is that? A bit weird, having a stranger walk up to us and tell us, but nice nonetheless! I have just been interviewed by Radio Cumbria's DJ Kevin Fernihough! I got a call off a friend who works at the BBC, asking me whether they could interview me for the lunchtime show. Then Kevin Fernihough called me, telling me exactly what he would be talking about and what questions I should expect. I was still nervous, though. Usually, I am the one doing the interviewing. It was quite educational to be on the other side of the mic for a change. We talked about my hometown, my reasons to move to Carlisle and cultural differences. Architecture, Salt & Vinegar and the Cologne "Karneval". So here it is: My very first radio interview!